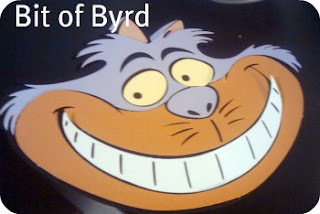 When my sister Apryl turned 18, we had an Alice in Wonderland Party. I have mentioned a few other times. 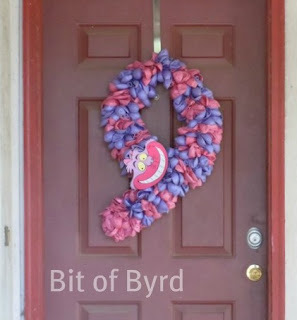 I had seen a Balloon wreath over at How Does She? 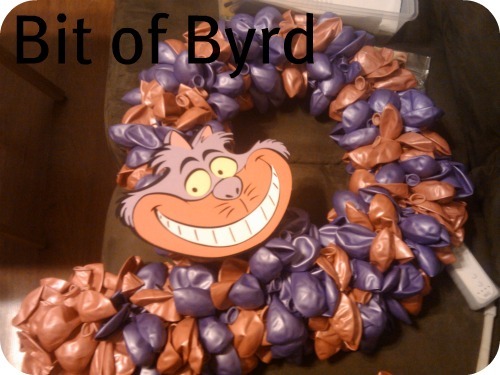 That was my inspiration for my Cheshire Cat wreath. With just that I could have created a great wreath... but I needed a face, and as it so happens for Christmas I had bought myself a Cricut. And the AIW cartridge was just about to be released. I pre-ordered it. And it was exactly what i needed! So unfortunately I do not have any pictures from this in the making. But it was very easy. 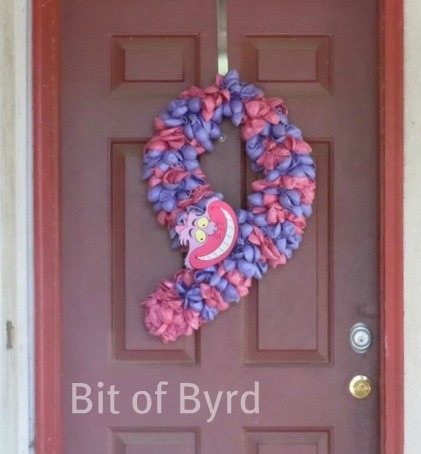 The tutorial for the Balloon wreath is basically what I followed. I actually put a whole bag of rubber bands on the pool noodle. Then I taped the 'tail' into place. You can see in the picture it looks almost like a "9". Just duck tape. The rubber bands are what I used to put the balloons on. They helped me keep a strip pattern. I did 3 rows of one color and 3 rows of the other. I alternated the balloons when putting them under thr rubber band so one would go mouth piece away from me. the next would be mouth piece towards me. That makes it hard to understand but if you head over to Meet the Newcombs, that is where i had the idea about the rubber bands and you can see if her picture how they arent all facing the same way. I used the floral pins to cover the duck tap and the end of the tail where I couldnt get a rubber band to hold. I hot glued my Cheshire face on and magic happened! Everyone that came in loved him! -Don't leave him outside too long, the noodle sags and the balloons get worn so they cant be used for anything else. -Plan ahead if you need specific colors so you can buy the balloons online. If I would have bought them online I would have saved so much. As it was I had to buy about 4 bags of balloons from party city... read.. not cheap! keep following me down the rabbit hole as I show you my other AIW crafts.